Let's do a little catch up, shall we? 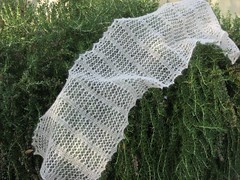 First up is a lovely Cami that is knit form a souvenier skein(s) from my trip to Tuscan, AZ. My Mother's family is from there and I went there for my first time as an adult. I went to a delightful knit shop near the University (of Arizona?) 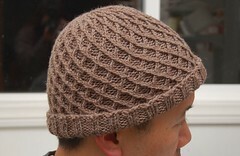 called Kiwi Knits. They have divided thier shop into rooms; animal room, vegetable room, sock room, etc. to organize the amazingly diverse election of yarn. Considering the desert (read: warm) location, the vegetable room was amazing. Cotton, silk, hemp, bamboo, linen and- get this- sugar cane. (Sing with me... C&H....pure can sugar... from Hawaii...) Seriously! Yes. I *might* have licked a strand. I won't tell. But If I did lick a strand I could tell you it is not sweet at all. It is, however, sweet to work with. Smooth and slickery, though a tiny bit splity. I decided to make the Honeymoon Cami. 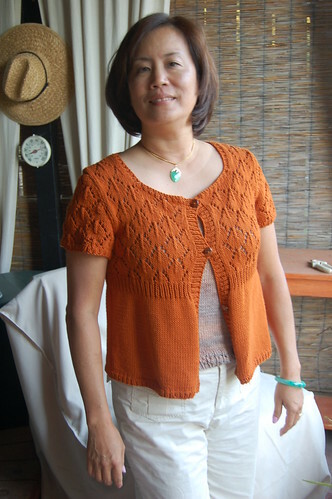 This is a well written pattern and the only mod was to raise the neckline a bit. 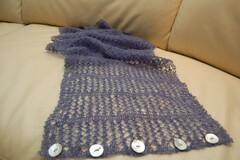 The yarn pooled a whole bunch but I decided to think of it as interesting raher than distracting. I really like this whole "souvenier skein" concept. Now, whenever I wear this cami I will think of my time in Tuscan and the connections I made there. Better than a dust collector, "fer sher". I had some trouble with the button bands- like always. Seriously, what is the secret to bands that lie flat and don't gap unattractively over the girls? I knit positive ease into the garmet, tried to get a button at the point of maximum (erm) stress, knit and then reknit again to get the ratio of picked up stitches correct... sigh. All in all it's isn't too bad. 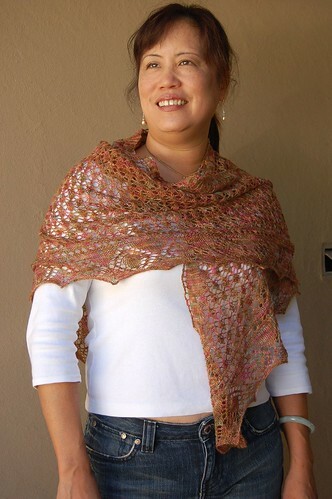 I love the way it fits and it is knit with Blue Skys Skinny Dyed Cotton ( I **LOVE** this yarn). This is the perfect summer sweater. 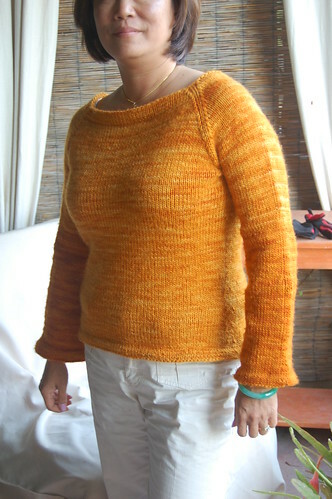 I managed to get my Tigger Sweater done just before this last cold snap, so I've worn this quite a lot already! It is the perfect comfy super soft sweater. Nearly as good as an old sweat shirt. And the color!!! OIY! Just the perfect thing to draw me out of mt shy, bashful, timid, meek and mild shell. This is a terrible shot- I am really not that fat! 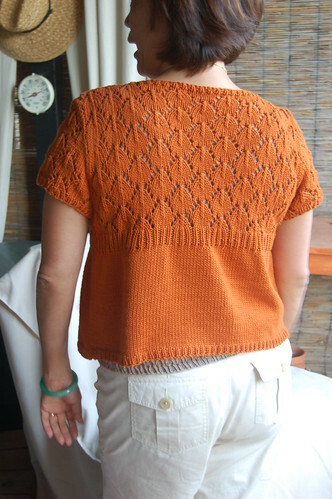 This is the hourglass Sweater from Last Minute Knitted Gifts. 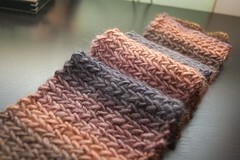 I used Malabrigo- natch. 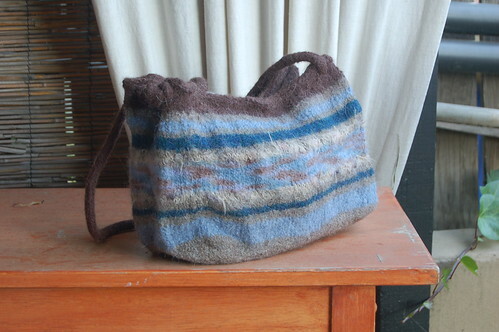 Lastly (for now), I completed the first of the stash busting felted bags. I've been knitting long enough to have an annoying amount of left overs- too much to toss, not enough to make a whole project. 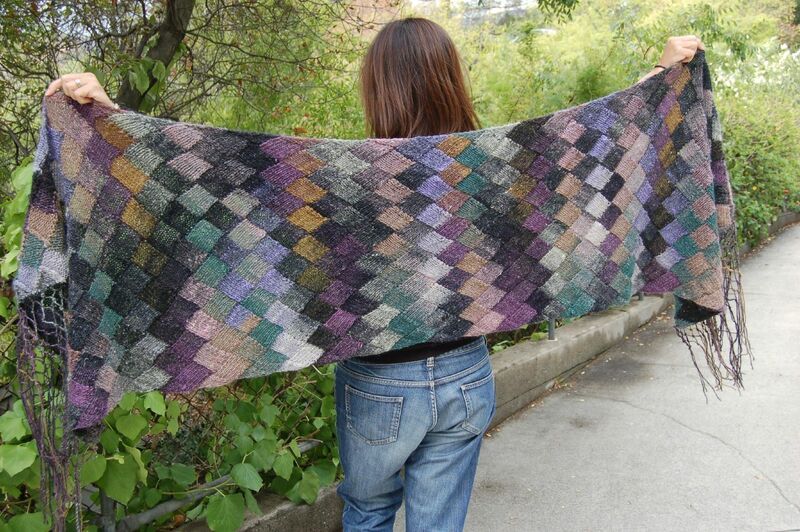 I have everything sorted into color ways and I hope to bust out enough of these to give to nieces for Christmas. I'm sure they would rather have money... but I just have to be the oddball aunt who gives the unusual. Aileen, if you're reading, mums the word! I might not get past this one bag!!! And yes, I'll think of something cool for Nephew. He's special. He's the only one. Whew! I really ought to do this more often. Then I can have nice, short, reasonable posts like everyone else.